Plants to 35 m, 10 dm diam. ; moderately heterophyllous. Bark dark gray, shallowly furrowed only basally on large trees, (greenish or yellowish white to gray and smooth otherwise). Branchlets reddish brown, becoming grayish yellow by third year, round, 1.2-3.5(-5) mm diam., coarse or not, glabrous. Winter buds reddish brown, glabrous, (shiny), slightly resinous; terminal buds (2.5-) 4-6(-9) mm, (glabrous); flowering buds separated on branchlets or clustered distally, (4.5-)6-10(-11) mm. 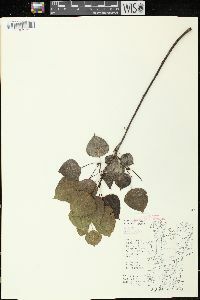 Leaves: petiole distally flattened at right angle to plane of blade, (0.7-)1-6 cm, about equaling blade length; blade somewhat circular to ovate, (1-)3-7(-12) × (0.5-) 3-7(-10.5) cm, w/l = ca. 1, base shallowly cuneate to subcordate, shouldered, basilaminar glands (0 or) 1 or 2, round, margins not translucent, not ciliate, apex acuminate to acute, abaxial surface whitish green, resin stains not obvious, (slightly glaucous), glabrous, adaxial dark green, glabrous; preformed blade margins subentire to finely crenate-serrate throughout, teeth (12-)18-30(-42) on each side, sinuses 0.1-1 mm deep, (surfaces glabrous or sparsely sericeous); neoformed blade margins finely crenate-serrate throughout, teeth (20-)25-40(-50) on each side, sinuses 0.1-1.3 mm deep. Catkins densely (20-)50-65(-130)-flowered, (1.7-)4-7(-12.5 in fruit) cm; floral bract apex deeply cut, ciliate. Pedicels 0.5-1.5(-2 in fruit) mm. Flowers: discs narrowly cup-shaped, obviously oblique, entire, 1.3-1.8(-3 in fruit) mm diam. ; stamens 6-12; anthers truncate; ovary 2-carpelled; stigmas 2, filiform, basal lobes expanded, erect. Capsules narrowly ovoid, (2-) 2.5-4.5(-7) mm, glabrous, 2-valved. Seeds (3-)5-7(-9) per placenta. 2n = 38, 57, 76. Flowering Mar-Jun; fruiting May-Jul. Dry to wet, open to closed woodlands and forests, edges of meadows and prairies, talus-slopes and canyon-heads, sites of human disturbance, timber cuts, mine tailings, gravel pits, quarries, roadsides; 0-3000(-4000) m; St. Pierre and Miquelon; Alta., B.C., Man., N.B., Nfld. and Labr. (Nfld. ), N.W.T., N.S., Ont., P.E.I., Que., Sask., Yukon; Alaska, Ariz., Calif., Colo., Conn., Del., Idaho, Ill., Ind., Iowa, Maine, Md., Mass., Mich., Minn., Mo., Mont., Nebr., Nev., N.H., N.J., N.Mex., N.Y., N.C., N.Dak., Ohio, Oreg., Pa., R.I., S.Dak., Tex., Utah, Vt., Va., Wash., W.Va., Wis., Wyo. ; Mexico (Baja California, Chihuahua, Coahuila, Nuevo León, Tamaulipas, south to Hidalgo and the state of Mexico). Clonal aspen groves develop rapidly following fires and other disturbances and may quickly decay in their absence as infections are transmitted through the connecting root system. 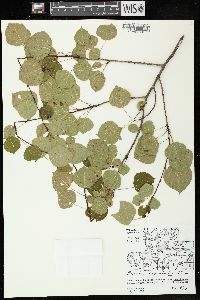 Populus tremuloides is the most widely distributed tree in North America, found throughout cold and cool-temperate regions from coast to coast and from within the Arctic Circle to the north rim of the Valley of Mexico. It ranges from sea level in the north and east to the north slopes of high mountains in the southernmost part of its range. The southerly locations, like that on Mt. Livermore in the Davis Mountains, Texas, the most southerly stand in the flora area, may be Pleistocene relicts. Groves are often occupied by single clones and show no sexual reproduction but persist and spread by root suckers. Clone formation commonly results also in striking differences in appearance and phenology of adjacent groves or blocks of trees (B. V. Barnes 1969). Some individuals display a particularly rich, yellow autumn coloration that makes them a standout among North American trees, particularly in the West, where this richness was the basis for segregation of P. tremuloides var. aurea. There do not appear to be consistent regional differences within the species that would justify recognition of subspecies or varieties (Barnes 1975). Instead, there is as much variation from clone to clone within a region as there is among regions. 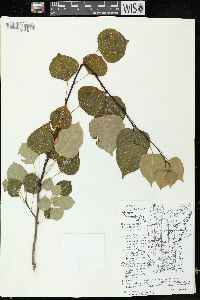 Populus tremuloides hybridizes with both the native P. grandidentata (P. ×smithii B. Boivin) and the Eurasian P. alba (P. ×heimburgeri B. Boivin) in southeastern Canada and the northeastern United States (B. V. Barnes 1961; T. A. Spies and Barnes 1982). 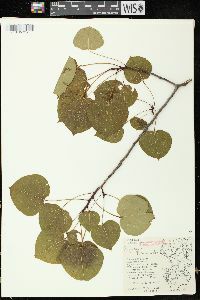 Populus ×smithii occurs as far west as the Niobrara River valley, Nebraska, ca. 350 km west of the nearest present populations of P. grandidentata. Preformed leaves are more ovate than those of P. tremuloides and have larger teeth. 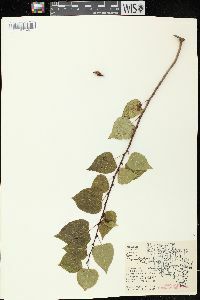 Populus ×heimburgeri has transiently tomentose twigs, buds, and abaxial leaf surfaces. 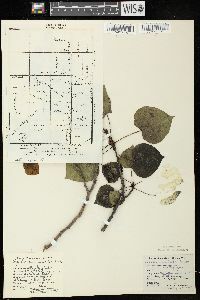 Contrary to some published reports (E. Lepage 1961; T. C. Brayshaw 1965b; B. Boivin 1966b; F. G. Bernard 1968), P. tremuloides does not hybridize naturally with P. angustifolia, P. balsamifera, or P. deltoides. The correct identification of such specimens is discussed under each of the purported parents. 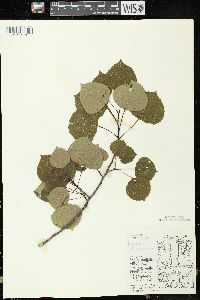 Plant: tree; to 30 m tall, but usually less than 15 m, forming groves by clonal growth; bark greenish or yellowish white and smooth or dark gray and furrowed at the base of large trees; TWIGS reddish brown turning yellowish tan by the third year, glabrous; winter buds reddish brown, usually not evidently resinous, glabrous Leaves: 2-7 cm long, commonly circular, but ranging from broadly ovate to reniform; margins minutely to finely crenate-serrate with 15-35 slightly graded teeth on each side (up to 50 on leaves of suckers), these usually with sinuses less than 1 mm deep INFLORESCENCE: CATKINS 2-10 cm long; bracts ciliate with long hairs; pedicels 1-2 mm long Flowers: with a deep cup-shaped disk, this 2-3 mm wide in fruit; stamens 6-12. Fruit: CAPSULES 4-7 mm long, lanceoloid, 2-valved Misc: Subalpine and montane forests, edges of meadows in mts., especially after fires; 1950-3050 m (6400-10000 ft); Apr-May (fr. May-Jun) REFERENCES: Eckenwalder, James E. 1992. 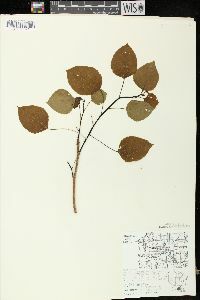 Salicaceae. Ariz.-Nev. Acad. Sci. 26(1)2. Medium-sized to large tree 15 - 32 m tall, trunk diameter 30 cm - 0.6 m Leaves: alternate, on 7.5 cm long (often longer than blade), flattened leafstalks (enabling leaf to tremble in the breeze), green above, pale beneath, 4 - 10 cm long, nearly as wide, egg-shaped to nearly round with a rounded or slightly heart-shaped base and short-pointed tip, round-toothed, thin, firm, and shiny above. In autumn the leaves turn shades of orange and yellow. Flowers: either male or female, borne on separate trees (dioecious) in hairy-bracted catkins. Male catkin 4 - 10 cm long and hairy with red anthers. Female catkin 4 - 15 cm long and hairy with scarlet stigmas. Fruit: a two-valved capsule, borne in drooping catkins, short-stalked, green, 6.5 mm long, narrow, and flask-shaped. Seeds light brown with cottony hairs attached. Bark: creamy white to yellowish green, thin, and smooth, becoming gray, thick, and furrowed on large trunks. Twigs: slender, reddish brown, very shiny, smooth, becoming grayish and roughened by the elevated leaf scars. Leaf scars crescent-shaped, with three bundle scars each. Buds: reddish brown, lance-shaped, short-pointed, angled, shiny, and sticky. Terminal bud 6 - 8 mm long. Form: narrow and rounded. 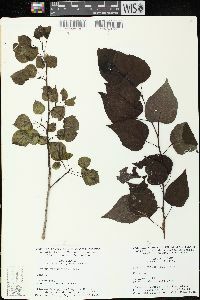 Similar species: The similar Populus balsamifera and P. heterophylla differ by having rounded, not flattened leafstalks. 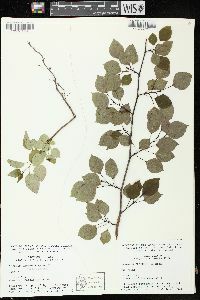 Populus alba differs by having hairy leaves and leafstalks. 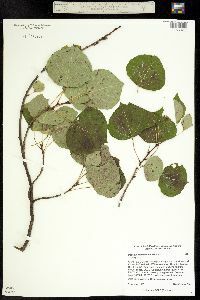 For comparison, the similar leaves of P. grandidentata are longer (7 - 13 cm) and bear larger teeth. Habitat and ecology: Frequent in low ground, often forming large colonies. Found in peaty marshes, boggy habitats, and sandy scrubby woodlands. It has also been found in waste ground, thickets, open fields, fens, moist prairies, woodland edges, and along roadsides. 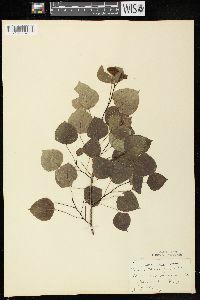 Notes: The wood of Populus tremuloides is used for pulp, furniture, interior trim, excelsior, boxes, crates, and matches. The bark is a primary food for beaver, and white-tailed deer eat the foliage. Populus species as a whole are subject to many diseases and insect pests, such as canker and tent caterpillars, which often kill the tree or make it unattractive. These risks, in conjunction with a water-hungry root system, have made Populus species less desirable for landscape use. Etymology: Populus is the Latin word for poplar. Tremuloides means "resembling the quivering poplar." This small tree is common in low ground in the lake area and I have never seen it growing on hills. It has been reported from all parts of the state but all of the specimens I have seen from the southern part of the state should be referred to the preceding species. It is doubtful whether it occurs far south of the stations shown on the map, and, if so, it will be found very locally. 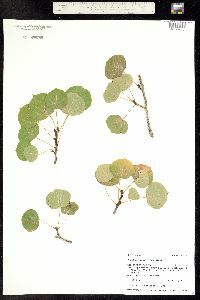 Common Name: quaking aspen Duration: Perennial Nativity: Native Lifeform: Tree Wetland Status: FACU General: Tree to 35 m, with generally smooth yellowish white or greenish bark, dark gray where shallowly furrowed, winter buds reddish brown, resinous. 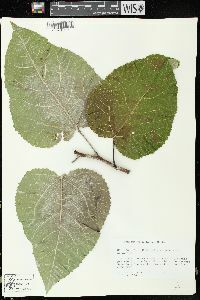 Leaves: Leaves whitish green beneath, dark green above, circular to ovate with an acuminate apex, minutely toothed, borne on a slightly flattened pedicel. Flowers: Catkins densely flowered, with the tips of the floral bracts bearing deep cuts at the tips and a marginal fringe of hairs. Disc flowers cup shaped, entire, with 6-12 stamens, 2 stigmas, and 2-carpelled ovaries. Fruits: Ovoid capsules, smooth, 2.5-4.5 mm long, 2-valved. Ecology: Found in wet or intermittently wet areas in woodlands and forests, meadow edges, prairies, and disturbed areas, from 0-10,000 ft (0-3048 m); flowers March-June. 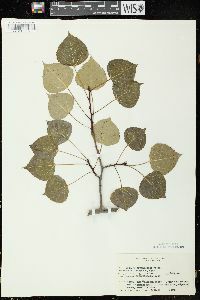 Notes: According to FNA, Populus tremuloides is the most widely distributed tree in North America, and in the southernmost portions of its range, may have clonal groves dating back to the Pleistocene era. 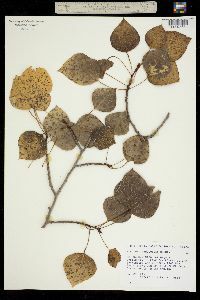 Due to the clonal nature of this species, it readily hybridizes with other Populus species, however, even within isolated colonies there tends to be a high amount of phenotypic variation. Ethnobotany: Decoction of bark taken as a vermifuge, to treat heartburn, to ease labor, stomachache pain, heart trouble, venereal disease, colds, ruptures, purgative, laxative, purgative, and worms. Powdery white outer surface used as a syptic and deodorant. 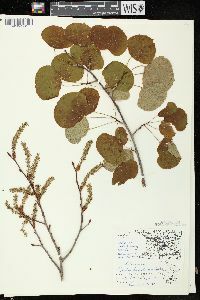 Synonyms: P. aurea, P. cercidiphylla, P. None polygonifolia, P. t remula subsp. 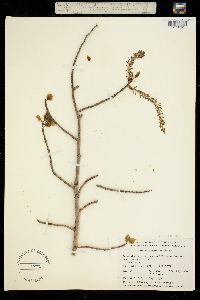 tremuloides, P. tremuloides var. 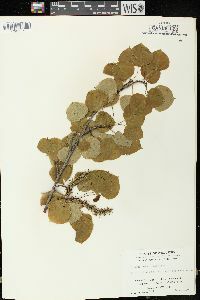 aurea, P. tremuloides var. 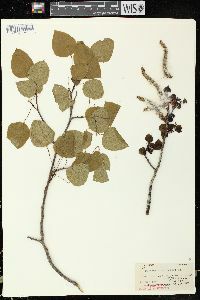 cercidiphylla, P. tremuloides var. 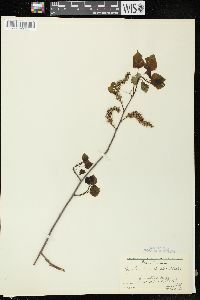 intermedia, P. tremuloides var. 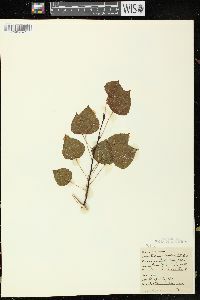 magnifica, P. tremuloices var rhomboidea, P. tremuloices v Editor: LCrumbacher, 2011 Etymology: Populus is Latin for -people" because the many moving leaves in a breeze resemble a moving populace, while tremuloides means like the quivering poplar or quaking aspen. Tree with light grayish-green smooth bark, becoming dark and furrowed in age; petioles strongly flattened; terminal buds brown, shining, glabrous or nearly so; lvs glabrous, dark green above, light green and slightly glaucous beneath, without basal glands, 3-10 cm, rotund-ovate to reniform-cordate, shortly acuminate to merely apiculate, the lowest lateral veins strongly ascending; lvs of short shoots finely and regularly toothed, with mostly 18-30 teeth to 1 mm deep on each side, those of the long shoots often with even smaller and more numerous teeth, or subentire; scales of the catkins cleft to below the middle into 3-5 lance-triangular lobes; stamens, stigmas, and frs much as in no. 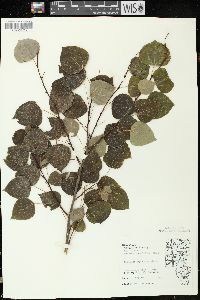 2 [Populus grandidentata Michx. ]; 2n=38, 57, 76. Moist upland woods and streamsides, often on cut-over or burned land; Lab. to Alas., s. to N.J., Va., Tenn., Mo., and Mex.